Lighting really does have a language to it. There are terminologies to help us categorize the specific jobs they have in creating a cohesive lighting design. While we are now adjusting to some of the newer terminologies such as lumens, color temperature (Kelvin) and color rendering index (CRI), there are other more tried-and-true terminologies that transcend advances in technology. These are called the Four Functions of Light. Getting comfortable with these will help you organize your lighting needs, as well as elevate your skills in communicating with other people on the design team. This includes architects, contractors, interior designers, landscape designers, and of course, lighting designerThe basic truth is that there is no one light fixture which can give you everything you need to illuminate a room properly. The trick is using a variety of light sources to create a flexible, inviting space. This is what is referred to as light layering. Task- Lighting by which you do work; such as the under-cabinet lighting in the kitchen, lighting in the closet or a reading lamp. Using only task lighting in a room will create little blobs of light, which is not really very inviting. Table lamps are a good example of task lighting. Accent - Lighting which is used to highlight objects in a space. This adds depth and dimension to an environment. Recessed adjustable fixtures, track lights, portable uplights and directional landscape lights all fall into this category. In the above image, the accent lighting is coming from the recessed adjustable fixtures. They provide visual focus for the coffee table, the two sofa back tables and enhance the texture of the stone on the facade of the fireplace. If they are the only source of light then you get the museum effect, where the objects in the room appear to be more important than the people. Decorative- These are what I like to call architectural bling. The main purpose for these lights is to look pretty. They help add sparkle to a space. Chandeliers and candlestick-type wall sconces fall into this category. They should not be used as the work horses for lighting a room. When they are too bright they can visually overpower the other elements of the design. For the living room shown above, the glass and metal lantern helps draw people into the space and provides a more human scale to this voluminous space. It is using only four 3-watt LED filament bulbs, which provide the equivalent of 20 watts worth of illumination per bulb. Yet, it appears to be providing the room’s illumination since most of the other light sources are hidden. If they are the sole source light they tend to become glare bombs, visually overpowering the rest of the elements in the space. 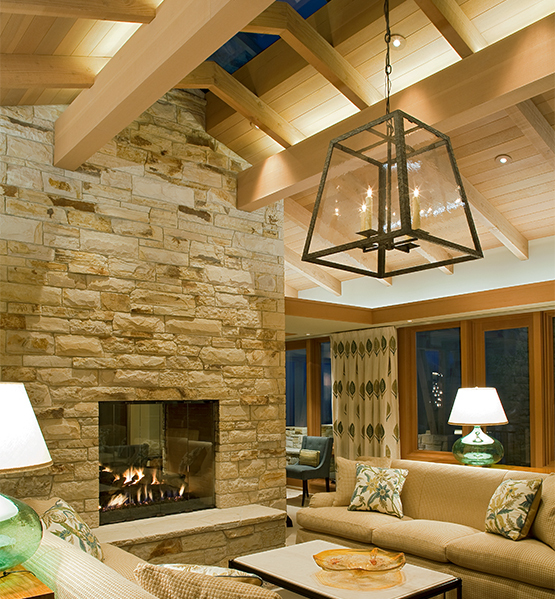 Ambient- This is the gentle overall illumination for a room. It softens shadows on people’s faces and fills the volume of the space with a warm glow, as if the room was being filled with the light of a roaring fire. Ambient light comes from illumination that is bounced off the ceiling. Such sources as opaque wall sconces, torchieres, pendant-hung indirect fixtures, and cove lighting can be used to create the ambient light. For the living room above, indirect linear LED strip lighting has been installed above the roof beams, as well as installed inside the cantilever that runs along the perimeter of the space. Here too, if this is the only source of light then you get the cloudy day effect, where everything has a flat even illumination.